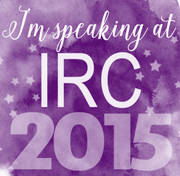 Last week I was at the Illinois Reading Council Conference and I had so much fun. One thing that is still new to me are the Notice and Note books by Beers and Probst. 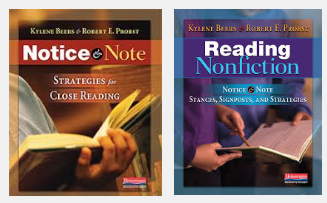 These books are built around strategies for Close Reading. 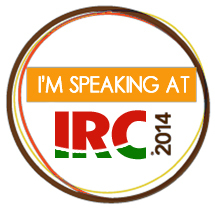 The big theme of their sessions was relevance. Obviously we want to take into account student interests when we teaching, and ideally we would give all students readings that were directly related to their interests. 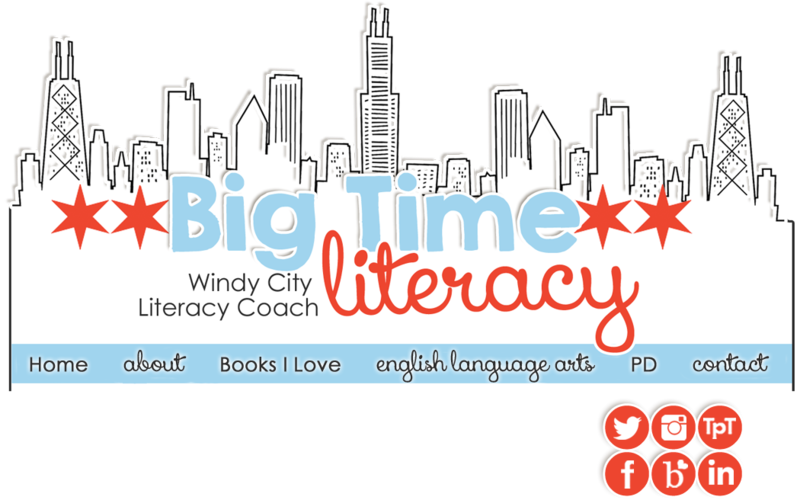 But, we also have to instruct classic texts, books and articles that students read at various grade levels as a whole class. The Outsiders. Romeo and Juliet. The Scarlet Letter. I get differentiation, but I also see power in one class, one book. This year, I'm only going to have one book that the whole class reads, and it's The Giver, which we are immersed in now. I've read The Giver with 6th, 7th, and 8th graders, and I say it's best interpreted by eight graders, but I digress. Back to relevance, though - since we can't give kids readings on their interests all the time, we have to build relevance into our teaching. 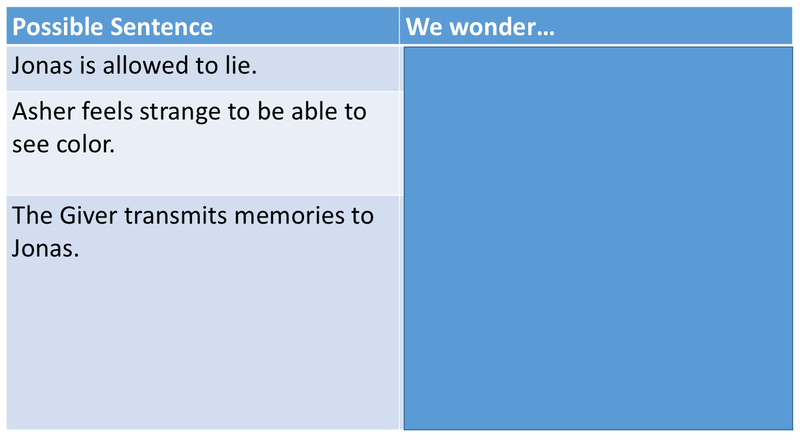 The strategies that Beers and Probst modeled to us last week are called Possible Sentences and Notice and Wonder. (Well, I'm naming the second one Notice and Wonder!) 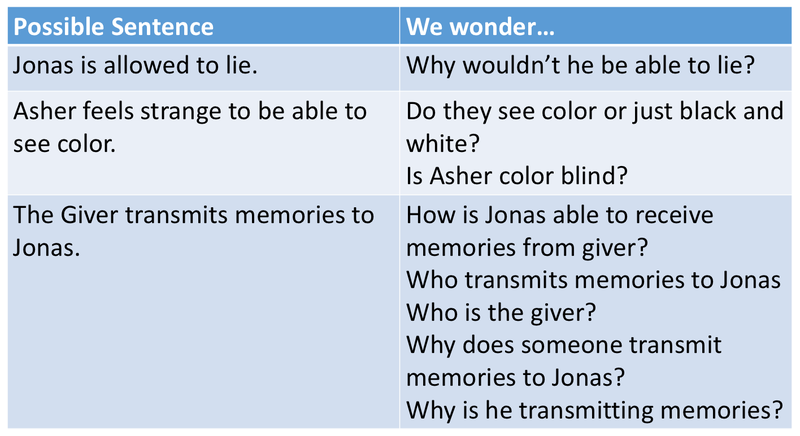 I used these strategies yesterday with my ELA class and they worked so flawlessly to engage kids to the text. Here's how to do it. Then I modeled to students how to write sentences, using words and phrases from the chart. I showed them a few I created, and then asked them to write two. Then they did a pair share. Then the pair wrote a third. Then silently they wrote two more. As you can see, they were concerned about the pill that Jonas takes and were wondering many things. As the class began sharing, it stemmed more questions. We were rolling! These Possible Sentences were created by kids but used the language from the teacher who has already read the book. 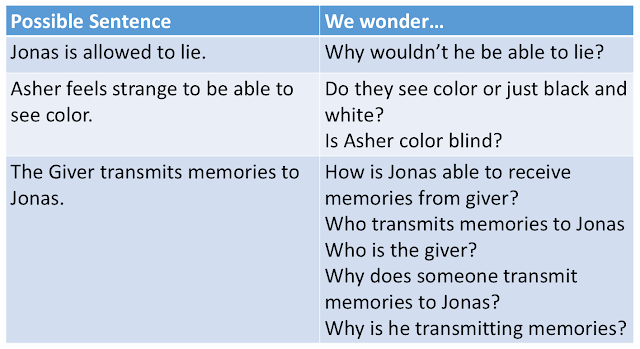 When you use this strategy, you create an easy way for students to predict using language you give them (so great for ELs) and then you invest them into the story by wondering together. The engagement yesterday was awesome after this strategy. I highly recommend it! Think of all the other readings we do in other content areas! When Beers and Probst modeled this strategy, they did so with a NF article about child labor laws in an African (African? Can't exactly remember where...) country. They didn't read the article with us, just did this pre-reading work, and it really stimulated our interest in the topic. I can see this being HIGHLY successful in any content area! Have you tried these strategies? Have you taught with Notice and Note? Keep the conversation going in the comments below!